In addition to all the flea markets in Quartzsite, another source for used items is the town’s thrift stores. I’ve visited three thrift stores in Quartzsite, and if there are others, I don’t know about them. 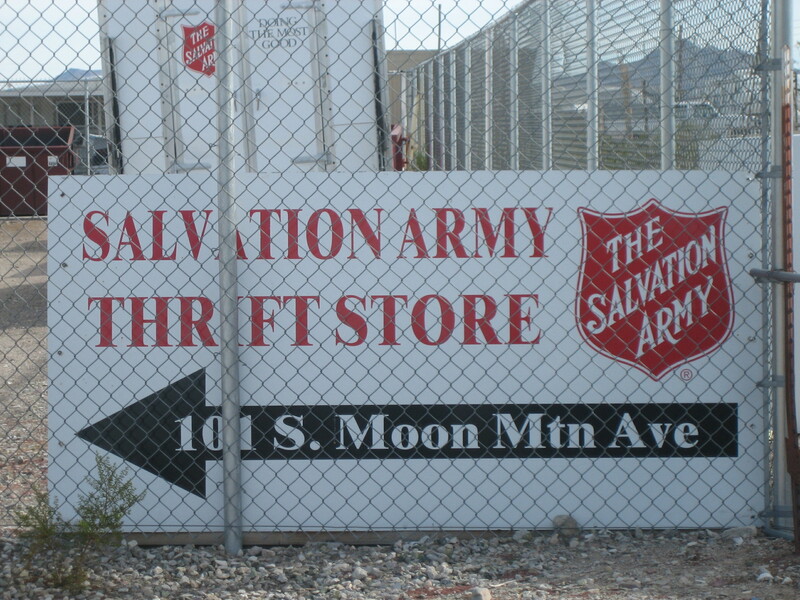 The Salvations Army Thrift Store is located at 101 Moon Mountain Road. From Main Street, turn north onto Moon Mountain Road. The Salvation Army store will be on the east side of the street, about half a block down. 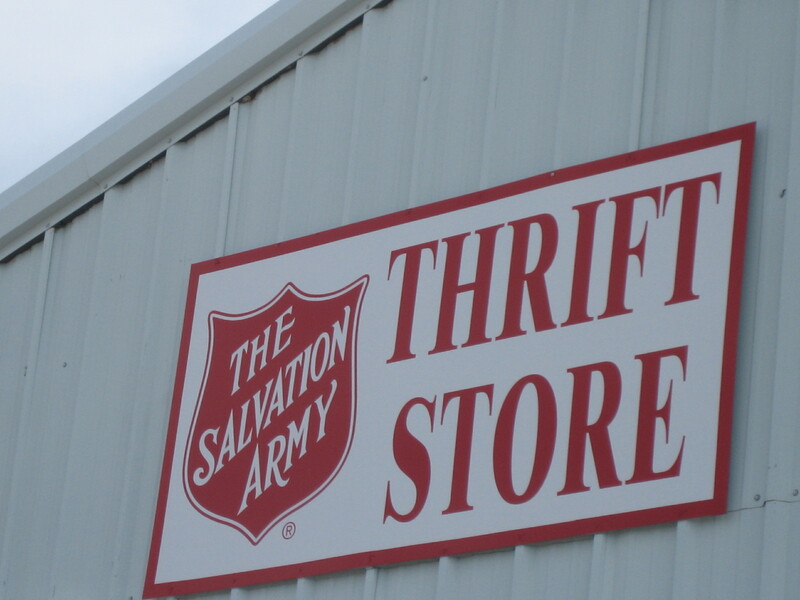 The thrift shop is across the street from the Isaiah 58 Project compound. Parking is in the gravel lot in front of the store. The Salvation Army Thrift Store has a small selection of mass-market paperbacks; I think they sell three for $1. The store also has cheap VHS tapes and a few CDs. There is usually a large selection of housewares, pots and pan, plates and glasses. The selection of linens and pillows tends to be small, and the items seem well used. The shoes available also tend to be well used, and I’ve never seen clothes here that I like in my size. 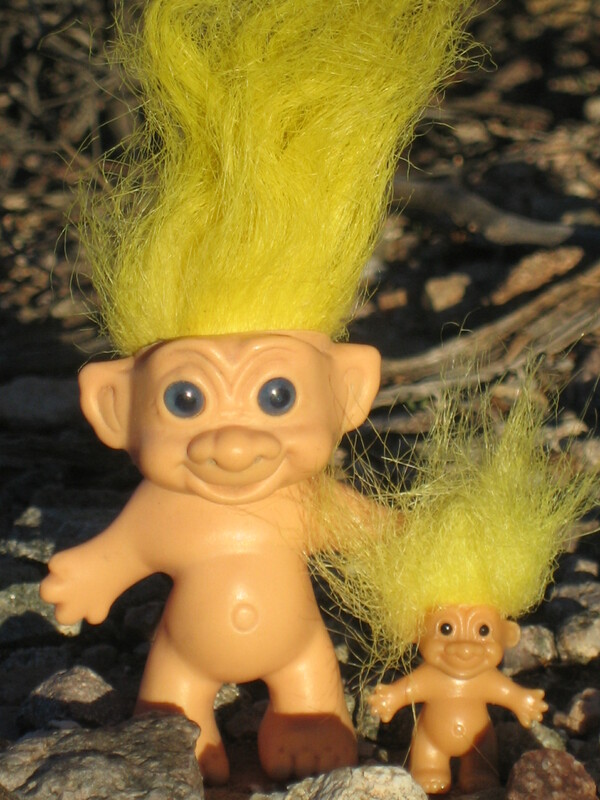 I’ve found a few fun things in the toy department, like a couple of small troll dolls (two for 50 cents) to send to my rock guy. In 2015, I got great deals on yarn at this store, but in 2016, the prices were higher for boring colors. Prices are decent here. Most clothing costs a dollar or two per piece. Many things in the housewares section are 50 cents to $1. (Higher end items are more expensive; I once saw a cast iron Dutch oven there with a sticker price of $30.) Small toys are very inexpensive, as are greeting cards. I definitely suggest the Salvation Army store as a place to look for needed items before buying new, and it’s fun to browse here even if nothing specific is needed. 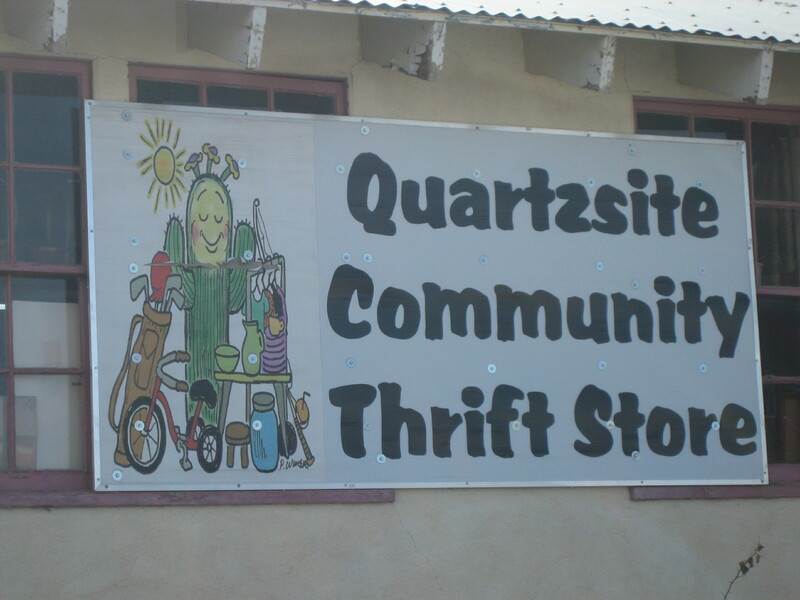 The Quartzsite Community Thrift Store (7 Showplace Lane) is located near the end of the street that runs along the side of Silly Al’s pizza place. The parking lot is also gravel and in front of the store. The parking area is not as big as the one at the Salvation Army store, but there may be more parking in the back. There is usually a stack of free books under a covered area on the east side of the parking lot, but I’ve never found anything I wanted to read there. The store offers some higher-end decorative items near the front of the store. The price of women’s clothing seems to start around $2; I’ve never seen clothes here that I like in my size either. I have found good prices on yarn at this store—50 cents to $1 a roll or for several smaller bits of yarn bagged together—but the selection was better in 2015. There’s a decent-sized selection of books in the second room, but I haven’t seen much there that I’d be interested in reading. Also in the second room are mostly inexpensive housewares and a small selection of well-used linens. 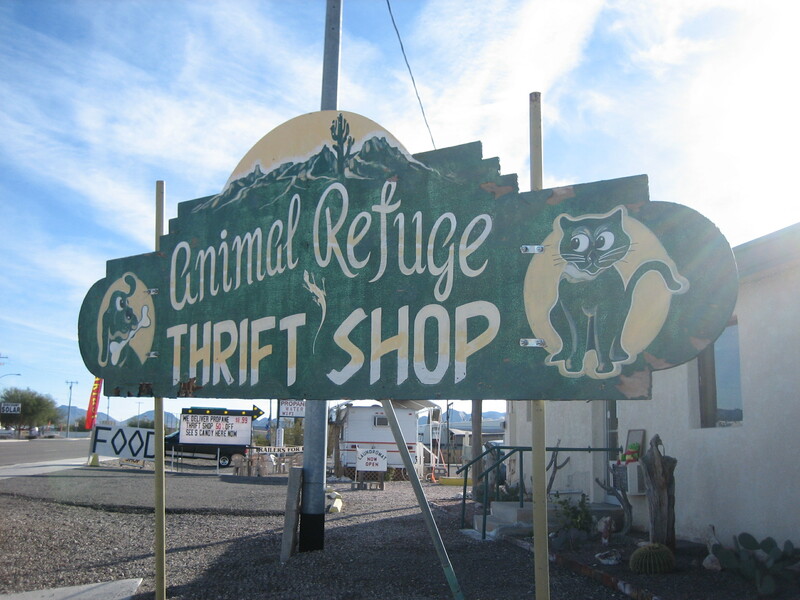 The Animal Refuge Thrift Store is on the other side of town, east of Central (Highway 95), on the south side of Main Street. When I visited this shop in 2015, it was cluttered and uninviting. In 2016, the store was filled with only the best merchandise, and the higher prices reflected the nicer inventory. As I was not looking for higher-end but more expensive items, I was not really impressed with anything in the store. I looked around quickly, realized what was up, and left. I’ve got no problem with a resale store specializing in higher-end and pricier merchandise. What I do have a problem with is when such stores call themselves thrift. To me, thrift means inexpensive. Why not call themselves upscale resale or high-end used or gently-used boutique? I guess they figure thrift draws people in, and they hope folks in a buying frenzy will find something to purchase. I do have to give the workers at the Animal Refuge Thrift Store props for keeping the store clean with uncluttered, neatly arranged merchandise. The store definitely looked nice. Also, the woman working when I went in was friendly and made sure I knew the proceeds from the store goes to help animals. Since I don’t really need anything these days, and I’m trying to buy less, I might not be the best person to review thrift stores. Still, I like to browse and see what’s available. I’m always looking for something better than what I have that’s selling at a good price. When I’m in Quartzsite, I like to see what’s happening at the thrift shops. I too need to buy less these days, but I do love to browse. Many times my excuse for going to thrift shops is to upgrade something that’s not working in my present “collection”. I continue to sort out especially now as I don’t plan to be moving. It seems to be a life style choice….and I always need to have a garage sale. Oh by the way….my son sent me a modified version of the thrift shop song…..there’s a very passionate thrift shp culture out there. I’m glad your son sent you the modified version of the song, Jennifer. He knows you well! I’d help you with your garage sale if I were there.